Christmas inspiration. 【SLAVIC GIRLS (WOMEN)】, ukraine girls your brides, russian girl for marriage..
Christmas is a time when people should distract from their daily routine and get inspired to celebrate the special event. This gift basket will help you relax and acquire necessary mood. This set is a perfect present for any lady that values good wine and fresh juicy fruits. Can you think of a better present in winter? 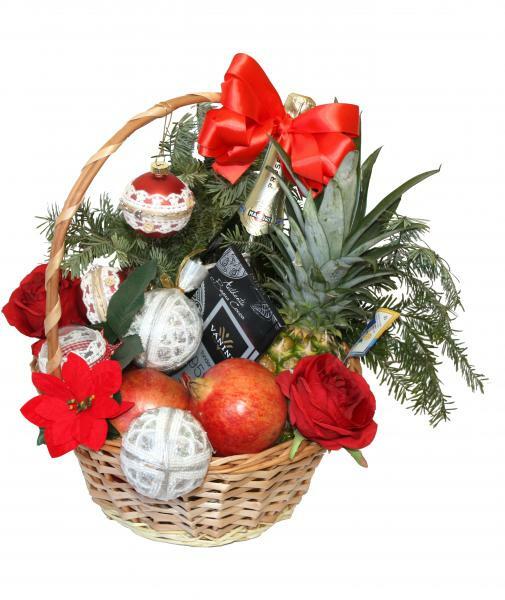 bottle of sparkling wine "Martini", 1 chocolate, 1 pineapple, 2 grenades and 5 apples, a set of New-Year toys, a basket, artificial flowers and fir-tree twigs for decoration.